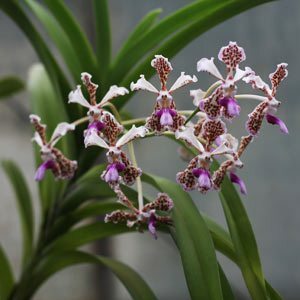 When you first see Vanda orchids growing in a nursery the immediate attraction is the large showy flowers. They are mostly grown in hanging baskets, and although you will read that they are ‘difficult’, and ‘not for beginners’, this all depends on the climate. They like warmth and humidity, and are suited to tropical and sub tropical zones. In these areas they are fairly easy. So you simply need to mimic these conditions. In cold climates, you will need to take lots of care, in warmer areas, with humidity, they thrive. Although there are over 40 species, it is the wonderful hybrids that most growers are looking for. Large, colourful flowers that present a ‘flat’ face are the ones most sought after. 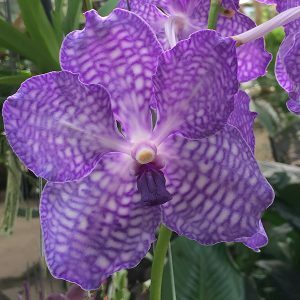 Vanda somsri blue classic is one plant that is widely used in hybridisation. Flowering time will vary, however in ideal conditions they will flower almost year round. Flowers are long lasting, 2 – 3 weeks is common. cylindrical or pencil shaped leaves and semi terete vandas which are a cross between the strap leaf and terete vandas. Being a fairly easy orchid to grow, most enthusiasts use a slatted orchid basket. A reasonably coarse pine bark orchid mix is well suited to Vandas. This basket culture helps with air circulation and drainage thus preventing many of the fungal problems. Growing medium will depend on the method of planting, slatted orchid baskets, or plastic pots. You can also most them on trees as these are an epiphytic orchid. In slatted baskets they can be grown with no growing medium at all.Most growers use a medium grade pine (fir) bark that is free draining. Strong filtered light is required, full sun causes the flowers to lack the vivid colours that are looked for. Most growers recommend a spray system that will deliver regular soakings. A timer set to deliver around 10 minutes of spray twice a day is adequate in most conditions. You can also soak the whole basket in water for around 5 – 10 minutes. Fertiliser is only required during the active growing season, and a 1/3 strength liquid orchid fertiliser every week is recommended. Temperatures above 20C (68F) are required for good growth, once temperature drop below this, flowering will be problematical for most species and cultivars. The root system of Vandas is thick and fleshy,they will find their way out of the basket into the air. It looks a little strange, however this is a good sign and they should be left like that. Drainage is important, as is good air flow, during summer, regular watering is essential, the free draining pine bark and the slatted baskets will allow quick drying of the growing medium and this is essential. Watering in summer is frequent,in winter, when plants are dormant, less water is required. Bright light and warmth are other requirements. A low of 15 C in winter to a high of 30 C – 35 C in summer. In summer plants need to protected from direct sun, a 30 % shade cloth is ideal in warmer climates. Fertilize in spring with a high nitrogen fertilizer, after this little extra is required. Orchids from Seedling to flowering size. 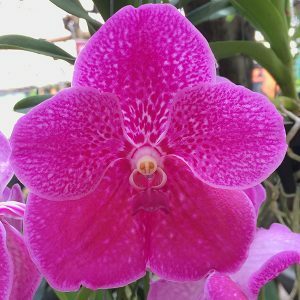 Vanda, Cattleya, Dendrobium, Phalaenopsis, Specie and much more. Flasks available, Orchid laboratory service for green pod sowing.